Providing advanced Seal-In technology for a wider range of users, Iceross Seal-In X is easier to invert and don, even for less active users who may have hand dexterity issues. The sleeveless design features a separate seal ring, which can be flexibly positioned for optimum suction regardless of limb shape. It can also be moved as necessary throughout the day for added comfort. Special seamless fabric elongates appropriately over the patella for knee flexion, while the soft, yet durable silicone blend helps nurture potentially fragile skin. 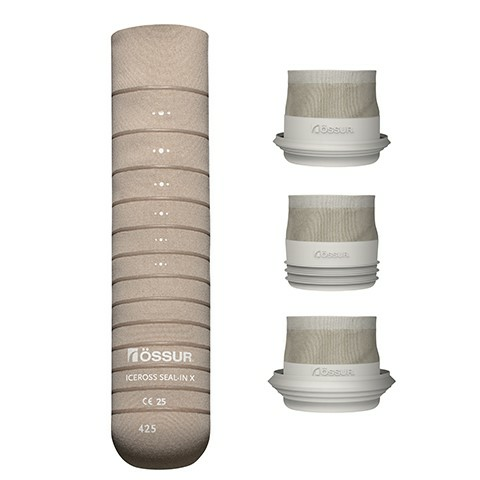 Seal-In X technology is ideal for use with Össur’s Unity vacuum system. Movable Hypobaric Membrane allows the user to position the membrane on a for them ideal location. Movable Hypobaric Membrane helps users who experience volume changes during the day maintain suspension.